court reporting Pasadena California | Todd Olivas & Associates v3.0 | Court Reporting Services in Orange County, Riverside, San Bernardino, San Diego, Los Angeles, Irvine, Santa Ana, San Jose, Sacramento, Fresno, San Francisco, Bakersfield. TO&A employs no court reporters, interpreters or videographers of our own. The providers we send are fully qualified and reliable independent contractors. Welcome to Pasadena! We're proud to have access to one of the best deposition-taking environments anywhere in town. If you're looking for a deposition suite that facilitates a quality court reporting, interpreting and videography service -- look no further! 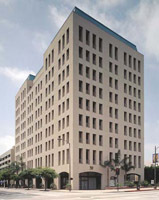 The Century Square business center is located in the Lake Avenue business district of Pasadena with convenient access to Harbor (110), Pasadena (210), and Ventura (134) Freeways. There is also easy access to two national and one international airport: Burbank is 20 minutes away, Ontario 40 minutes and Los Angeles International 35 minutes. The TO&A Conference Center offers an exceptional court reporting environment. Your busy law firm can take advantage of the convenience and professionalism of our well-appointed conference/deposition rooms and state-of-the-art audiovisual capabilities. Our experienced administrative staff is happy to assist you, and we are committed to providing our clients with memorable service and quality care. "You all were amazing! I called the morning of the depositions for service and it was not even an issue for your company; they made it happen! I hope to do business with you again." To schedule a Pasadena Court Reporter, please schedule online or call (888) 566-0253. We'll provide you with a freelance court reporter, interpreter, and videographer in Pasadena, California. The court reporters we send are state licensed (where applicable), and always prompt and courteous. Our goal is your complete satisfaction which is why we only work with the best court reporters available. Our interpreters are all certified, all languages -- and be sure to tell us which dialect you need if it's an exotic language.